Further research following tutor feedback on Section 3. Landscape. 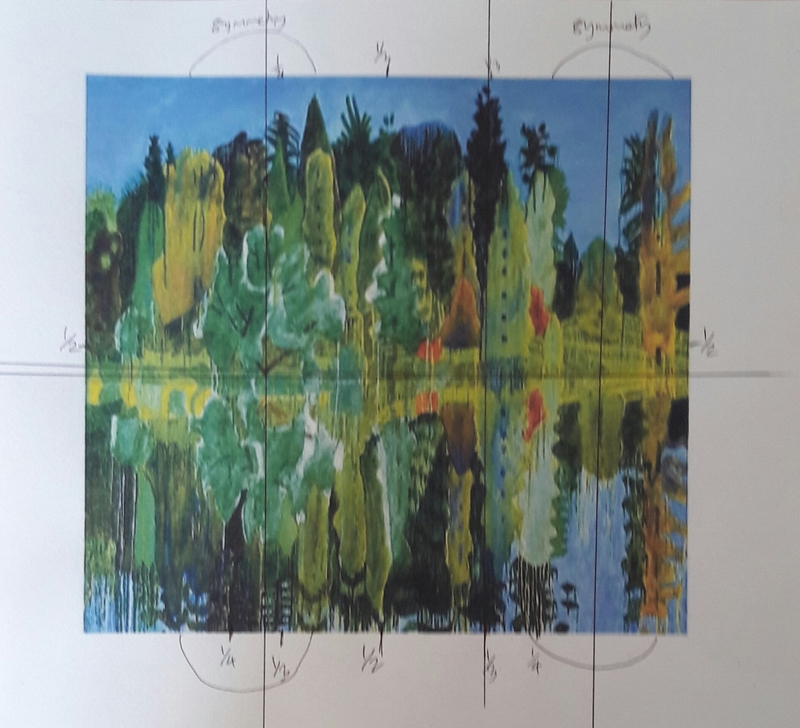 Tutor suggestion: look at Peter Doig regarding his compositional devices: 3rds and horizontal / vertical reflections. I also think you may find interest in his juxtapositioning when representing depth, whilst also reinforcing (painting’s) surface. Analyse these aspect of the works alongside the rich mark-making qualities, surface pattern and monochrome / high-key palette. 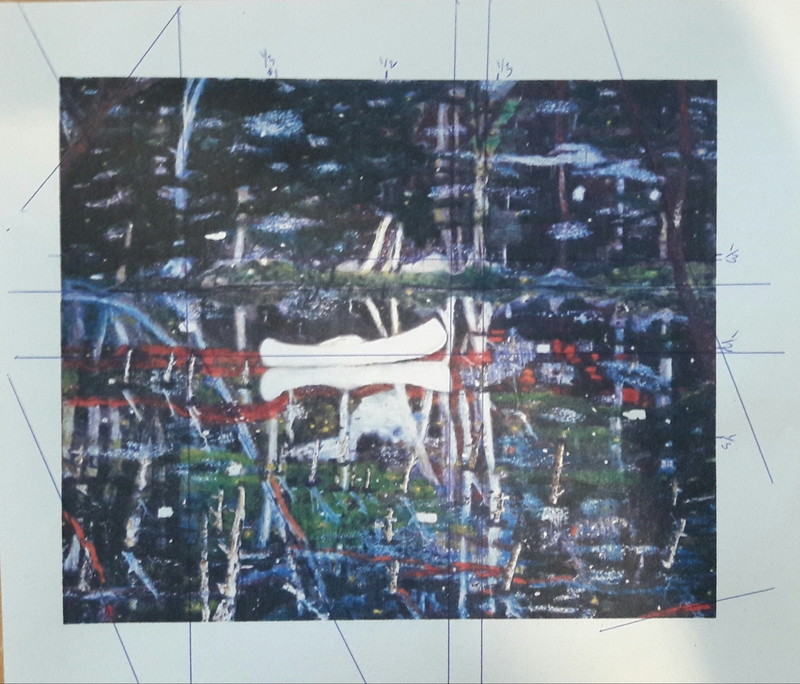 Looking at the composition of Doig’s painting White Canoe. The canoe falls almost exactly on the half way point of the vertical. On the horizontal it takes up most of the middle third of the painting. To the right of the canoe there is a strong vertical showing trees and their reflections which runs down a third of the way in from the right of the picture. There is more going on in the bottom half of the picture and in the right hand third. There is a series of diagonals from the bottom left of the picture to the top right. These diagonals are quite subtle. The image is of a serene scene – a canoe, still water, reflections – but the painting is not serene, it is busy and fractured. Do you need to know that the inspiration for this painting came from a still from a horror film to get a feeling of unease? In an interview with The Telegraph Doig said the scene in the film reminded him of a Edvard Munch painting. The colours in the painting are blues, greens, orange/reds and white/greys standing out against the deep blue/black of the night time scene. 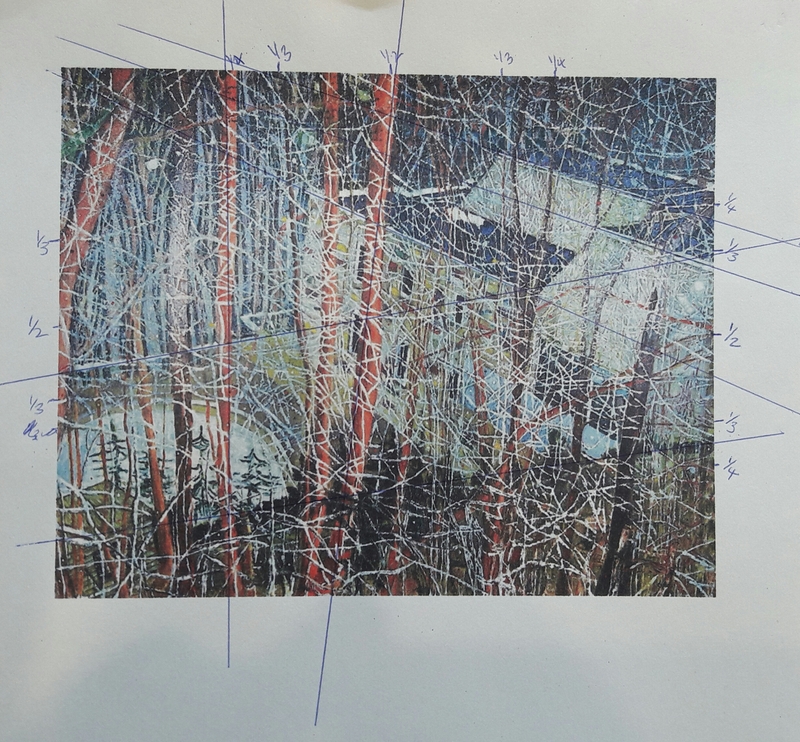 In the Architect’s Home in the Ravine Doig uses strong diagonals in the background which are broken by the foreground trunks in a rhythmic pattern across the picture. The strongest coloured trunks fall on the quarter and half points and lie to the left of the picture while the building, which is the subject, lies in the right hand two thirds of the painting. In a further layer, everything is broken up by the grey/white twigs and brash which cover the whole of the painting. As in White Canoe, orange/red, grey/white, blues and greens are the main colours with some brown/black in the foreground and blue/black in the background. The composition gives the painting great depth and a slightly eerie atmosphere because the building is so obscured by the surrounding nature. Ski Jacket is a diptych in which the left hand side is slightly larger than the right. A dark clump of trees in a diamond shape centres around the joint of the diptych. I drew lines along the edges of the patches of colour and found they created triangular shapes throughout the picture. The end result is quite star like. The colours are beautiful pinks, creams, yellows, greens with the dark green/black at the centre. The subject of the picture is a ski resort in Japan. It is an astonishing piece of work with the unconventional composition and subject matter all of which teeters on abstraction but never becomes completely abstract. In Reflection, the composition is carefully considered but unconventional. At first glance the picture is almost symmetrical but the feet at the top are to the right of the central point. The reflection takes up almost the whole picture with only a sliver of ground and the bottom of two legs in the top 9% of the picture. The reflection itself is broken up with patches and marks. While the reflection starts at the top of the picture there is a symmetry through the centre of the picture as the legs at the top are echoed in the reflection of trees at the bottom. The colours are greens, yellows and greys with a deep greenish black. The reflection is all “surface” but also shows the depth of the scene above which we don’t see. After looking at Peter Doig, it was interesting to look at the work of Adrian Berg. I wasn’t conscious that I knew this artist but I recognised some of his work. Berg made repeated paintings of Regents Park from his Gloucester Gate Studio. The series is featured on Adrian Berg’s website (it is unclear who maintains this website as the artist died in 2011). Berg painted the view from different windows and his balcony so the view is not always the same. The styles vary from quite realistic to stylised and semi-abstract. I was drawn to Berg’s paintings in a different series of Stourhead, a National Trust Estate in Wiltshire. Berg’s pictures of trees reflected in the still water of the lake at Stourhead echo Peter Doig’s White Canoe. Stourhead 30th June 2000. Adrian Berg. I think this is a beautiful picture. There is the obvious horizontal symmetry around the reflection in the water. There are also internal vertical symmetries. John Virtue in relation to landscape and abstraction. I have to admit looking at John Virtue paintings makes my heart shrivel. They are so bleak. I don’t know if he intends them to be bleak or is caught up in the abstraction of a landscape. But how can you look at a view of London or the sea and not be excited by the colours? There is an interesting piece on Virtue on the OCA website in which Virtue comes across as an admirable artist. Thoughtful, experimental and enthused by his work and his subject. In his article on Virtue in the Guardian, Simon Schama lauds Virtue for the qualities I find hard to enjoy, his grimness which Schama sees as realistic. I lived in London for 5 years and the river to me is a place of life and vibrancy with boats and people. It is where London opens up reflecting light from the sky. Maybe you need to see Virtue’s paintings in real life – they are on a massive scale – to get the full impact of his work. Author ewilsonartPosted on July 17, 2017 July 26, 2017 Categories Part 3 ExpanseLeave a comment on Further research following tutor feedback on Section 3. Landscape. I enjoyed the limited palette which reduced the number of decisions I had to make. I used coloured pencils. 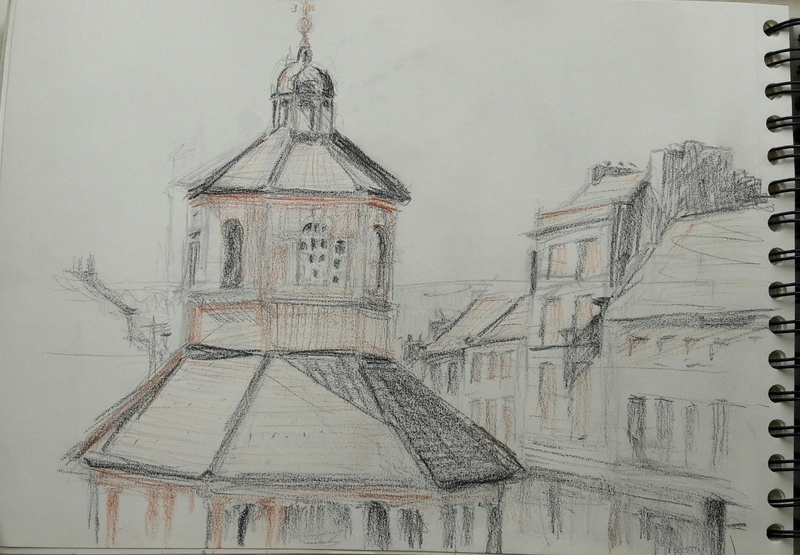 On reflection, the picture would have been more balanced and better compositionally if I had drawn in the houses to the left of the central building. I would have preferred to get the perspective on the roof of the central building correct!